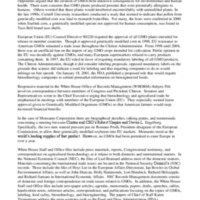 This collection consists of records related to the Clinton Administration’s policies regarding agricultural biotechnology, specifically the creation and use of Genetically Modified Organisms (GMOs). It contains correspondence, press material, reports, Congressional testimony, memoranda, research materials and emails. These materials address topics including international trade negotiations with the European Union, food safety and labeling, and research on GMOs.